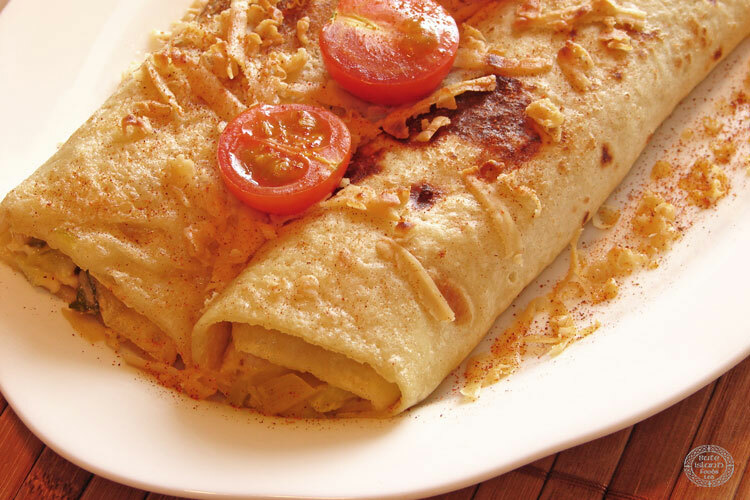 Rolled pancakes filled with creamy and 'sheesy' leeks. Great as finger food or as a main meal. Sieve flours, baking powder and salt into a large bowl. Add the oil and whisk in the milk. Allow to stand for 10-15 min. Dice the leeks, then steam or boil them for 8-10 minutes, until soft. Drain well and mix in 2/3 of both Sheeses. Heat oil in a frying pan, add 2 large tablespoons of batter mix (depending on size of pan) and spread across the pan, fry until lightly brown, turn over and fry for a further 30-40 seconds. Repeat and stack pancakes on a plate when cooked. Add the Sheesy leek filling and roll pancakes up, top with the remaining Sheese and pop under the grill for 1-2 min.